Busting the Porcelain Veneer Myths! Home » Busting the Porcelain Veneer Myths! Porcelain Veneers (sometimes known as porcelain teeth) are a thin layer of porcelain placed over a tooth to improve the aesthetics and function of a tooth. They are designed to enhance the appearance of your smile whether you want to change a few teeth or want a complete Smile Makeover. Porcelain Veneers are made of a ceramic material which are chemically bonded to the tooth. When considering Veneers, the shape of your face, smile line and complexion are looked at to determine the final result. There are some common misconceptions of what dental veneers are, and what is involved. 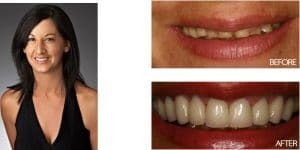 When people talk about cosmetic dentistry and porcelain tooth veneers they often think about the typical ‘Hollywood’ smile which can be artificial looking with big square, too white teeth. This need not be the case. Actual case of Dr Hooman Golestani. Note how natural the veneers are. The shade of your teeth will be decided based on your expectations and in conjunction with your dentist and the laboratory. A natural colour that will complement your complexion is best, but if you wish for a brilliant white smile that can also be achieved. The shape of your face and smile line will help determine how many dental veneers are needed and what shape the veneers should be. Your dentist will advise you on what looks best and most natural but ultimately the decision is up to you. We can even incorporate minor imperfections for a very natural result if you wish. People often believe that having porcelain veneers placed on their teeth will weaken them but in reality it is quite the opposite. Veneers are very fine pieces of ceramic that are chemically bonded to the teeth meaning that less tooth structure needs to be cut away. When done well it is considered minimally invasive. Dental Damage. There is a slight risk that the underlying dentin may become damaged during the enamel removal process. Every care is taken to ensure this does not occur. Until your final veneers are fitted you wear a set of provisional temporary teeth (temps). As these temps are not cemented you may experience sensitivity. This is transient in nature and will abate as soon as the final veneers are bonded. There is no permanent sensitivity. Porcelain veneers are designed to last 10-12 years according to international standards. You can extend the lifespan of our veneers by seeing your dental professional routinely for cleans and examinations. Doing so can identify issues early before a veneer de-bonds. In some cases, a veneer can be re-bonded but at the end of its lifespan a new veneer may be necessary. We have seen some cases last in excess of 20 years! Ultimately it comes down to the patient, the dentist, the lab technician, the materials and the technique. But to expect your veneers to last forever is just not realistic. Want to know whether veneers are suitable for you? Call 1300 625 625 now to reserve an appointment or visit http://bit.ly/Dental359 to book online. 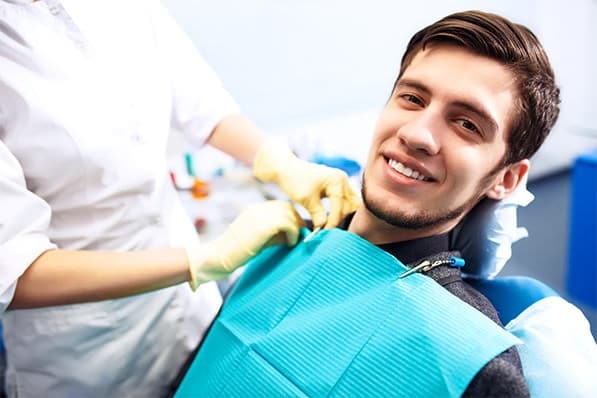 What makes a good cosmetic dentist? Here is one of our wonderful patients John, talking about his life changing experience with the All on 4 Dental Implants at Dental 359 Malo Clinic. If you’d like more information please don’t hesitate to call our practice on 1300 625 625 or check out the link below. Want to spoil mum this Mother’s Day? Here’s your chance to WIN 1 of 2 amazing prizes that will make mum all smiles on her special day ?! Complete these 4 EASY steps to ENTER! Winners will be drawn on Friday 10th May and notified via Facebook. ENTER NOW! Good luck ?